Yet another example of Stephen Moore being a complete fool. "It's just another reminder that the Republican establishment did not change Donald Trump. Donald Trump changed the Republican establishment," says @jaketapper as the KFile reveals how Stephen Moore and Larry Kudlow once criticized Trump's policies, but now defend them. Jeers to @federalreserve board nominee Stephen Moore for once telling a group, "You don't want to live in Cincinnati or Cleveland or, you know, these, you know, armpits of America like that." Excuse us? The comments prompted the Twitter hashtag #ArmpitsofAmericaUnite. 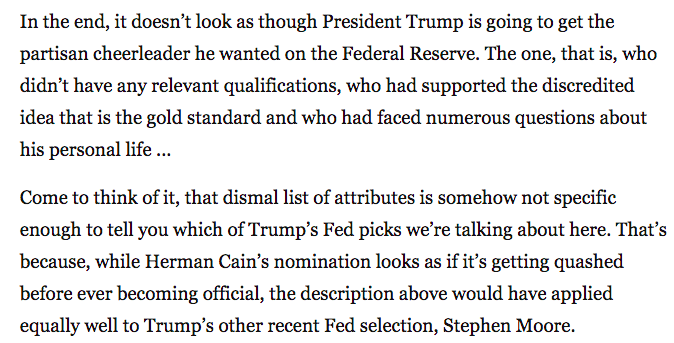 Stephen Moore will have to contend with an awkward history with Senate Republicans to get confirmed to the Federal Reserve. I got 9-9-9 ideas for a Fed nominee but Hermain Cain ain’t one. Pretty incredible track for Larry Kudlow and Stephen Moore. Listening to an old interview between the two in summer 2015. Kudlow compares Trump's immigration plans to the Holocaust. Moore calls Trump's politics "crazy" and an "extreme nativist." Kudlow disparaged Trump supporters as "the nativist fringe." NEW: I did a deep dive into Stephen Moore's views and it's hard condense in one tweet so it will take a few. Moore has called for abolishing the Fed, he believes social security is "a ponzi scheme," he's said he's not "a big believer in democracy." Stephen Moore advocated eliminating corporate & federal income taxes entirely, calling the 16th Amendment that created the income tax the "most evil" law passed in the 20th century.